Northside Festival 2017 is coming in hot. From June 7th through June 11th, Brooklyn’s music and innovation festival plays host to over 100,000 creative and cultural people in one of America’s prime melting pots. Utilizing small clubs, hotels, outdoor venues and so much more, it’s almost impossible to miss if you’re in the area. But you’re going to want the Ears to Feed x Impose Magazine showcase on your radar. On Friday, June 9th, we will take over Terra Firma at 119 Ingraham St. to bring you some of our favorite musicians of the moment. The full lineup includes YVETTE, Pop. 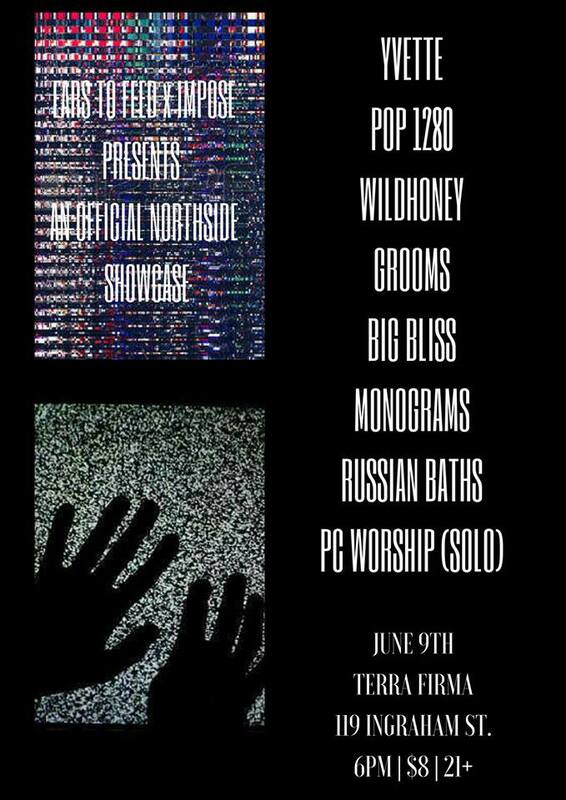 1280, Wildhoney, GROOMS, Big Bliss, Monograms, Russian Baths, and PC Worship. It’s going to be a night of absolute insanity, and we can’t wait to party with the east coast. The event is 21+ and starts at 6pm EST. Tickets are only $8 per person, free with your official Northside badge. For more information on the event, check out the event Facebook page. Tickets are limited, so get them before they sell out!